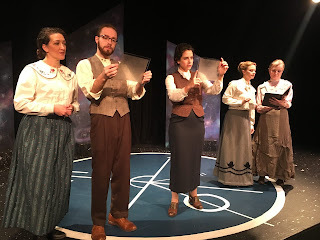 If I tell you that Silent Sky, the new play at Steel Beam Theatre, is about a smart, young, educated woman with a passion for astronomy, I won't be doing it justice. If I tell you that it is a play about loving sisters separated by that passion but later reunited by time and circumstance, I won't be doing it justice. If I tell you that it is about marginalized women persisting while the male-dominated world diminishes their contributions, I won't be doing it justice. Lauren Gunderson's play about Henrietta Leavitt. ​Playwright Lauren Gunderson weaves a complex, gorgeous tapestry of interrelated themes and ideas—passion, persistence, devotion, sacrifice, sexism, suffrage, legacy, forgiveness and female friendships. But none of this explains the hilarity, the audience's frequent outbursts of laughter throughout the performance! ​Mounting this play has apparently been a passion project for director Sean Hargadon. He has coaxed recognizable characters and three-dimensional performances from a formidable cast and helmed a creative team that includes lighting design by Andy Murschel, set design by Jen Johnson, costumes by Marge Uhlarik-Boller, star painting by Tiffany Jasinski and sound/video design with Jenny Giering. Everything is skillfully integrated and the well chosen costumes feature some interesting pieces that effectively illustrate the historical period. ​Paige Brantley in the pivotal role of Henrietta Leavitt gives a remarkable, nuanced performance as the impassioned astronomer. She possesses an expressive face and so much more. You won't want to take your eyes off of her! She is matched moment for moment by Kassandra Hesek as a devoted sister/daughter/wife/mother, Jake Busse as an officious supervisor smitten by Henri's passion, Julie Bayer as taskmaster turned suffragette, and JoAnn Smith as a nurturing, pioneering coworker. Together they are a dream cast! ​This period drama about one remarkable woman and her inner circle exquisitely staged in Steel Beam's intimate performance space asks some BIG questions and its well-crafted script, imaginative stagecraft and colorful characters offer some stimulating insights. Richard Pahl is an actor, director, and writer, who has worked in professional, community, and college theater for close to 40 years. He has traveled the country plying his trade at various regional theaters. He was the creator of both Playwrights' Advocate and Page To Stage - incubators for new play production, where local and regional plays were commissioned and simply staged in front of live audiences, providing critical feedback for the playwrights. Pahl also served proudly on the Elgin Cultural Arts Commission from 2007-2014.